I love to read the comments you guys post. Itâ€™s always great to see whether you agreed with my review or had a differing opinion I might not have have considered. I particularly enjoy the suggestions you leave. 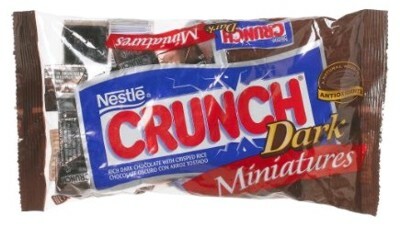 On my article reviewing the expired 100 Grand Dark Bar, a fellow Candy Addict staff member, Monica, used her keen insight in my search for a great crisp rice bar, and she recommended I try Nestleâ€™s Crunch with Caramel. I did just that and didn’t mind it as much as I thought I would. Having had my interest piqued in various Crunch Bar varieties from her suggestion, I then decided to try the Crunch Dark Bar. I have had this bar before, and wasnâ€™t too fond of it, but it had been some time; I often find myself originally not liking certain pieces of candy until, guided by the sagacity of fellow addicts out there, I’m compelled to give the piece another go. Though the standard size bars are no longer available for wide-purchase, Nestle reissues this spin-off of the classic in miniatures. In honor of Halloween, my local H.E.B. stocked them in bags containing an assortment of various Crunch products. Room Temperature: This piece has a great snap as I bite into it. Honey notes percolate the chocolate in an unexpected but pleasurable manner, bringing a refined sweetness to the piece. Complementing the honey is a fruity, but not intensely so, aftertaste. There is even a slight creaminess to the dark chocolate that adds to the confectionâ€™s complexity. The Nestle’s Crunch Dark Bar tastes the best at this temperature. Chilled: There is a smoky aroma to this piece, which is shaded a little darker than your milk chocolate counterpart. The crisp rice pieces are not as crispy as the original, but there is an alluring woodsy taste, almost cherry in overtones, that pervade the piece. Frozen: As opposed to the smoky aroma, this wafts a burnt one. The actual chocolate has a nice crunch to it, resulting in the piece being a bit crispier. As for the taste of the chocolate, itâ€™s slightly bitter, without the floral notes of the other temperature gradients. When frozen, coffee overtones reveal themselves, making it taste the most authentic dark chocolate of the bunch. So, did I fall in love with a new crisp rice bar as a result of Monicaâ€™s advice? Not exactly. Thereâ€™s nothing egregiously wrong with them per se, but nothing about them screams Awesomely Addictive either. I do think they possess a better, more layered taste than the original, but not as great as the Crunch Crisp Bar. Regardless, I was surprised by the extent to which I did enjoy them, as evidenced by the contents of the bag disappearing in one day, and am glad I gave these babies another taste. At Easter you can find Crunch Dark Chocolate with Caramel eggs…..they are my favorite version of Crunch.